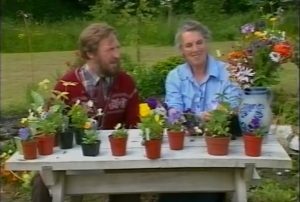 Mary Mottram appeared on a gardening programme presented by Terry Underhill Gardening For All for Television South West. She spoke about her life and her cottage garden plants which she grew at home at Yardwell Gate on Exmoor. Terry Underhill (an expert plantsman and horticulturist) presented hundreds of episodes of the half hour show for eleven years (1981-91). These programmes were also transmitted on Anglia TV, and some programmes have also been shown in New Zealand, North America, Canada, Holland, Germany, Scotland, Ulster and Korea. The programme ended when TSW lost their franchise to broadcast in 1992. This episode was broadcast in 1985. Mary died in 1986. The GERANIUM ‘MARY MOTTRAM’ Geraniaceae is available from some garden centres but is slow to propagate but Pulmonaria Mary Mottram is also available and is a stronger reliable plant. Mary was born in 1926 to Kathleen and William Fury in London where she lived with sister Elizabeth and brother Ronald. She was an evacuee during the London Blitz in World War II and married surveyor Kenneth Mottram after the war and lived for many years near Seaton in Devon, eventually establishing her cottage garden nursery on Exmoor in the late 1970s. They had six children: Tommy, Sally, Harry, Alex, Toby and Kathleen, however Kenneth and Mary separated in the mid 1970s, Kenneth remaining in Seaton while Mary moved first to Somerset at West Lambrook and finally to Yardwell in Devon. Yes it is a bit spooky seeing mum after all these years – so well spoken and knowledgeable. If only you could go back in time and start again with all that you know now – life would be a breeze. The weird thing is I am now older than she was in this programme. I was working in Bristol at an advertising agency as an artist at the time – and with no internet I randomly rang an agency in Exeter where they got the signal for the show – and asked the receptionist out of the blue (a complete stranger) if she would do me a favour and video the programme – I explained the story and she kindly videoed it and posted the VHS to me – and I sent her a cheque (!) to cover the costs. She was a saint. Those were the days!